Thank you, Barbara! I had fun working on it! SUPER feminine, right? I love it when I get a chance to decorate in pink!!! I am especially thankful because I really didn’t want to post the fall tablescape I had! Thank you, Delia! I’m glad you like it! Oh, Alycia…this is BEAUTIFUL! Your details with deep, well-thought-out meaning are so touching! What a beautiful way to remind friends and loved ones. Thanks for sharing. Thank you, Zuni! This was by far one of my favorites ever!!! Thank you, Marlis! This was the most fun putting a table together that I can remember since…..well, you know! We had such a good time. It’s always such a nice affair I would have been heartbroken had I not been able to do it this year. Making those pumpkins will make you nuts!!! I probably should have primed them first to make the paint dry faster. That glue is no picnic, either! My goodness, fabulous tables!!!! I love your “blinged” pumpkins!! They are adorable! Oh my goodness! You are so awesome! That is an award winning display and for such a great cause. I’m going to post a link to it on my page! The floral head is amazing and so are the bling pumpkins! You rock! You are too kind, Liz! Thank you! 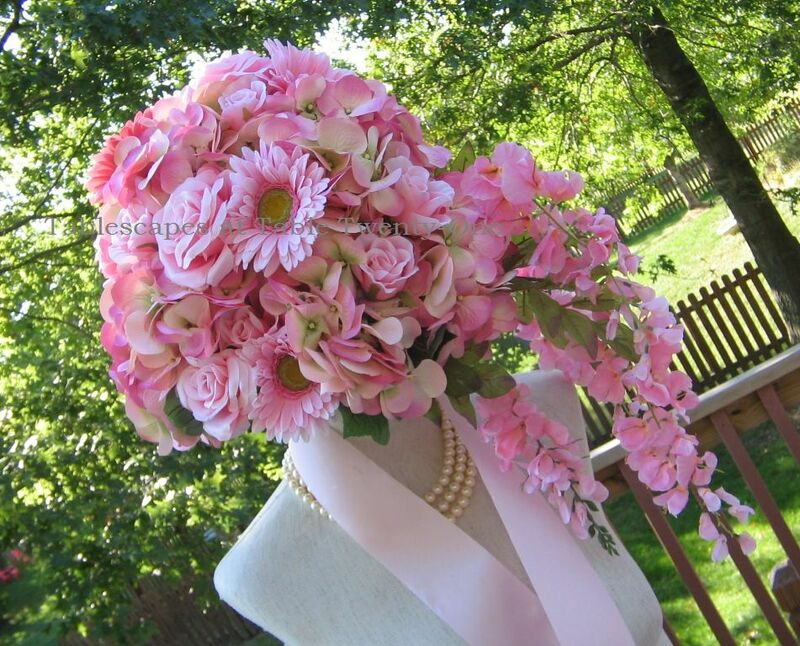 That floral head was a lot easier to make than I first envisioned. The pumpkins, on the other hand…..! 😦 What a pain! It was worth it in the end, though. I’m still peeling that glue off my fingertips! I agree with what Fabby said I’d like to see this get extra recognition! You are so sweet, Fabby. Thank you! It’s easy to create something pretty when you’re doing it from the heart. I’m sure you know that firsthand! This tablescape is absolutely breathtaking. I love the layered tablecloths, the gorgeous flowers, the color pink, the beautiful china and your sterling is one of my favorite patterns. I love anything with a crown. You created a masterpiece for such an important cause. 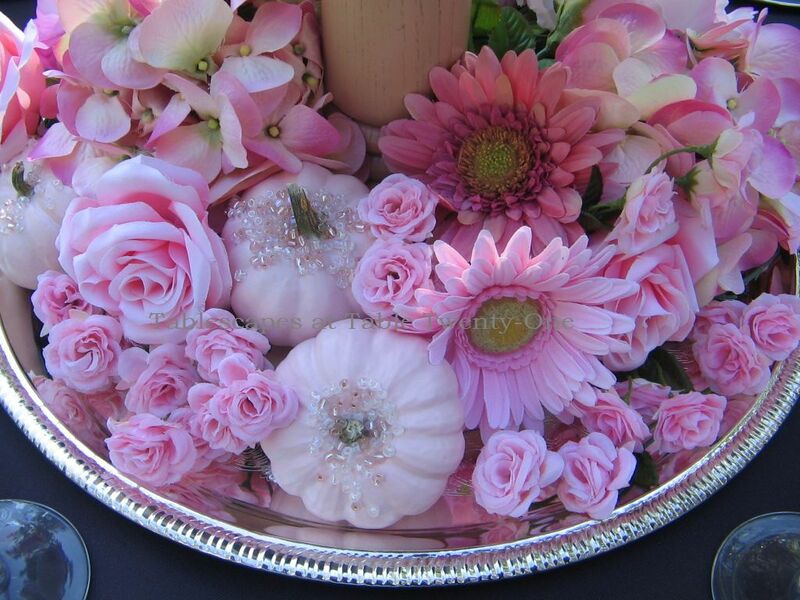 Those pink pumpkins with a little bling are just the pefect detail to a perfect table. How lucky were your friends to attend this luncheon. Mammograms are so important for women’s health and I just got a reminder from my doctor to schedule mine. I lost a dear friend to breast cancer when she was far too young and I will never forget her. Hi, Bella! I’m so sorry to hear about your friend. That indeed is why it is so important to get those yearly checkups. My hair stylist remarked today that she had hers done yesterday and hated them “pulling and tugging” on her. I told her to just be happy she has something to pull and tug on!!! I had mine done in May, and I’m due for “that other painful thing” now. Ugh! All in the name of good health! Thank you for stopping in tonight. I really appreciate it, and I’m so glad you liked it! Take care! What a touching tribute to the one who had cancer, and such a show of solidarity from everyone. You are such a good person, and I am proud to know you. Thank you, my sweet. Thank you. Alycia, this is so beautiful. What a truly generous heart you have. Good morning, sweet Linda! Thank you so much! THIS is why I belong in Kansas City with my friends and neighbors. I don’t know what I’d do without them! Enjoy your day!!! Alycia~ Only you would serve up your dress form on a silver platter~ how clever! 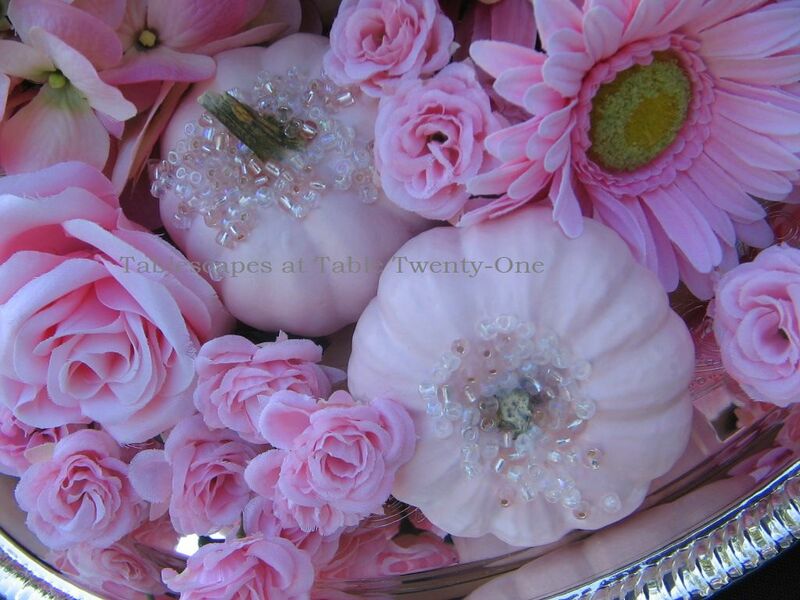 I love your pink blooms cascading down the form and painted pink PUMPKINS! What a creative nod to the season~ with a touch of feminine bling, no less. 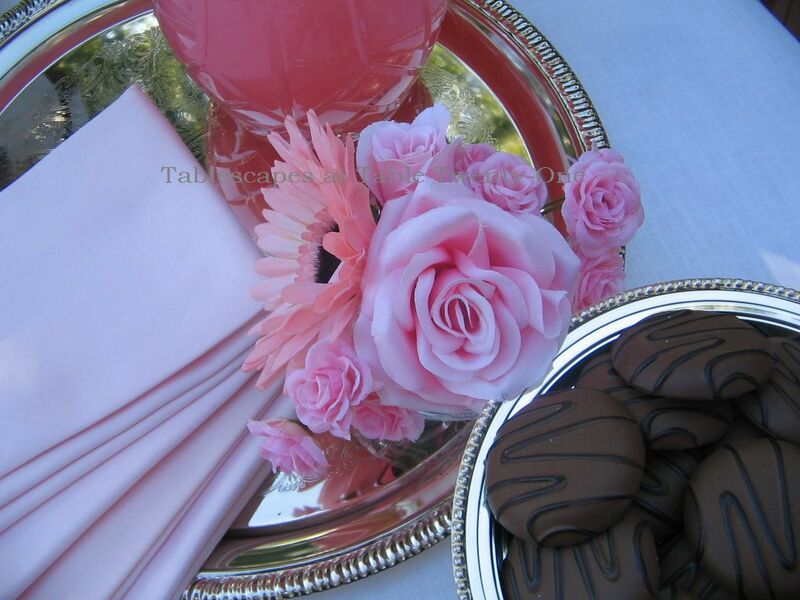 All your details are so perfect for such a worthy cause~ love your napkin fold~ The chocolate is such a wonderful rich color & foundation~ beautifully paired with the pink! Alycia, I adore all of your tablescapes, but I think this is one of your most beautiful in style and message. I know I’ve said this before, but I’m constantly amazed at your creativity and attention to detail.Your use of the bust form is absolute genius! Love her hat and pearls. 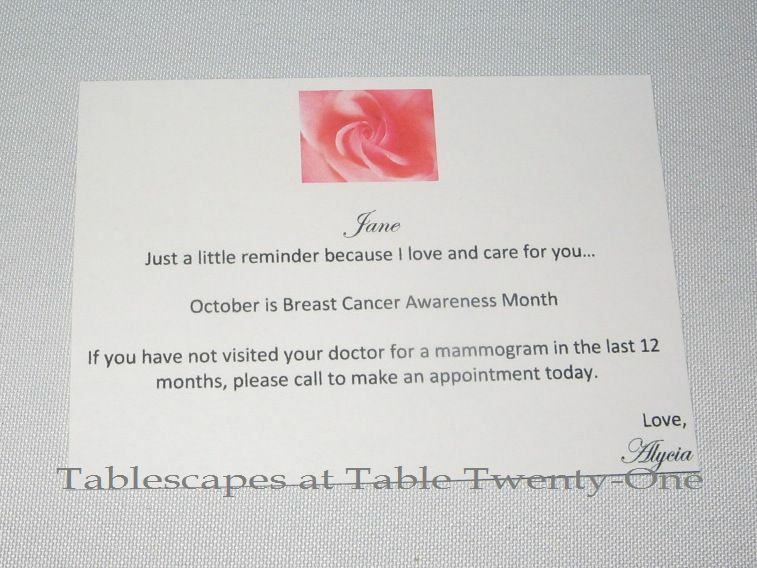 Every aspect of your tablescape is perfection including reminders for mammograms. Am I gushing? Yes! Alycia, I just saw the post for this. What a strikingly gorgeous table! Your use of elements was just spectacular! 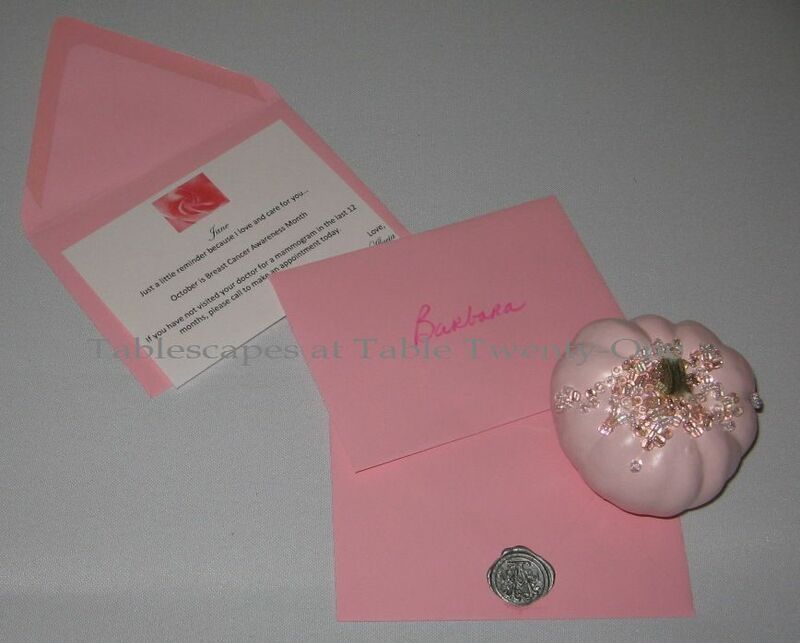 Love that you used the napkins, reminiscent of the pink ribbon…and the blinged out pumpkins…just beautiful!! What a lovely, feminine table! Good morning, Shenita, and thank you! My husband actually came up with the idea for the “sash” as he called it on the bust form! He is really getting into this…a little too much, I’m afraid! 🙂 Glad you like it! Alycia: Beautiful! How lucky your friends are to have such a beautiful lunchon served to them by such a wonderful and beautiful friend. Love the bling pumpkins and the message for each.Breast cancer checks are so very important! What a great way to remind your friends. Well done!! Thank you so much, Cindy!!! Alycia, this is truly one of the most beautiful and moving tablescapes you have created. I love your silverware! I wonder why!!!! No, you may NOT have it back! 🙂 And I’m holding your Mikasa crystal for ransom, by the way! 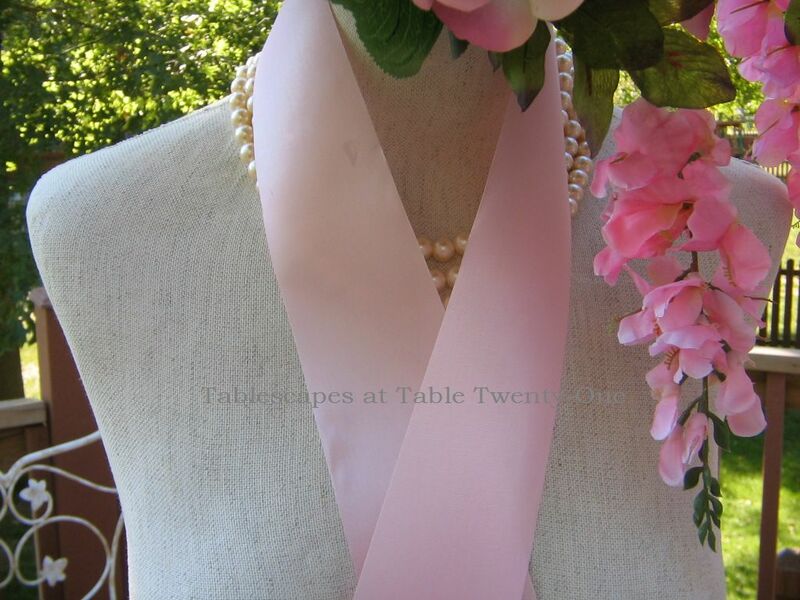 I am a breast cancer survivor for 18 years,Your tablescape is so beautiful. Thanks for the tribute to us. I didn’t know, Vernice. That makes this feel that much more special to me. I am officially dedicating this blog post to y-o-u! Thank you so much for honoring me by stopping in! Alycia, this is such a clever table! I’m glad you were able to do your annual tablescape — and especially glad you shared it with us. There are some really nice ideas here. The occasion and the encouragement could not be any classier. 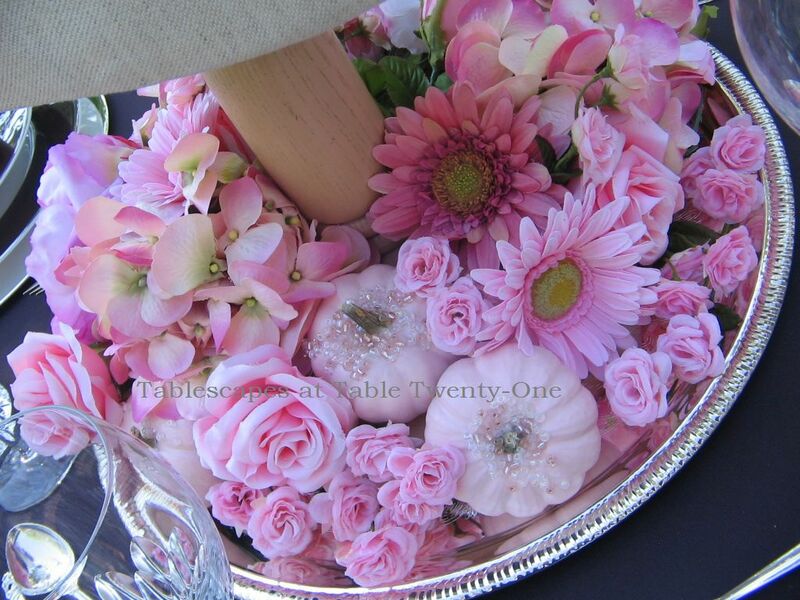 These are beautiful colors with the pink, and make a gorgeous table! The centerpiece is just beautiful! It looks like it was a perfect day! Hi, Jacqueline, and thanks for stopping by! It WAS a perfect day. The food was good, the friends were amazing, the wine was flowing (yes, in the middle of the afternoon! ), and LIFE just felt a little bit sweeter! Wonderful table for a wonderful cause!!! 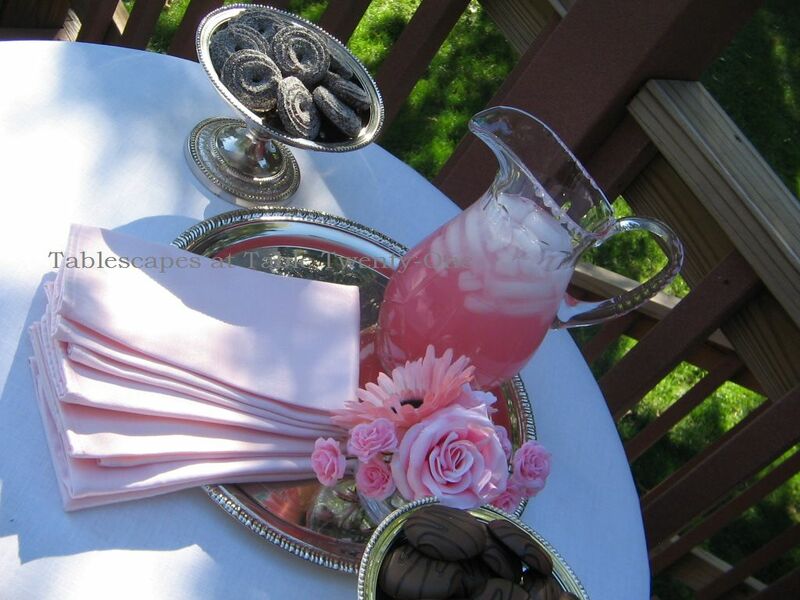 Your table is so girlie and pink and so important…perfect right down to the pink lemonade!! This is such a beautiful reminder. Every detail is gorgeous. The pinks blinged pumpkins are just darling. You’ve thought of everything for a delightful autumn ladies gathering. I do have my card and need to make my appointment for next month. Hi, Martha! Glad you will be making that appointment! Thanks for stopping by!!! You did an outstanding job! It all looks GORGEOUS! I love those pumpkins, but can just imagine the work that went into making them. Thank you, Pam! Glad that pumpin making fiasco is all over and done with! Once again……just beautiful!! Does your brain work in overdrive??? I wish I lived a little closer so I could see this lovely table for real! Hi, Suzy! My brain doesn’t work at all. That may be the saving grace! 😉 It was all heart going into this one. No brain whatsoever involved! I wish you lived closer, too. I would be so happy to have you at my table!!!! Thank you, Christine. A labor of love! I just adore your blog and ALL the ideas you bring to the table (pun intended) I am always inspired and blown away! This is just….Awesome! The bust is the perfect touch, what a fantastic idea….I could give you a standing ovation but, you wouldn’t hear me! Alycia, this table is absolutely arresting! I love your centerpiece, it really makes you stop and think. The flowers are so gorgeous. I love the blinged out pumpkins. I bought one like that that I used on last week’s table and was thinking of doing it to some larger ones, but listening to you, maybe I won’t! Great idea to mix the fresh and silk. You always have such lovely tables and events. Hi, buddy! Thank you! I saw your beautiful blinged white pumpkins and loved them! As you may know, our money has been so funny around here it is ROTFLMFAO. (I think that is the correct acronym!) 🙂 So…I had to create my own. Only cost about 32 cents per pumpkin. That’s more my billfold’s speed these days! The only thing about making them is that you really have to be careful with that glue, and you have to be very patient with the sides of the pumpkin. It takes about 20 seconds per bling bit for the glue to dry. It wasn’t until way into the process I figured out that it was easier to use some of my husband’s surgical forcep thingies to apply them. Duh! As for the flowers, since we’ve been “poor” I have not been able to just go out and buy all the fresh flowers I want when I want them. My friend had supplied me with a huge box of fresh, but there were no hydrangea or the droopy type that I used on the side. So…faux it was! Thanks for stopping by! There is a lot of love in this table. What a beautiful way to celebrate life, but not forget how fragile it can be. I can’t tell the faux flowers from the real ones because they are ALL gorgeous. Your little pumpkins look so elegant! Very beautiful (and very girl-y!) table! I love all the details you added to your table.It is a beautiful way to encourage us all to have that mammogram.The bling on your tiny pumpkins is so pretty. Thank you, Carolyn! The bling was the most challenging detail. That glue is STILL embedded under my fingernails. They really mean it when they say to wear gloves!!! Celebrating your friend’s victory over breast cancer is a good reason to create such beautiful tables. I love everything you have done, and your guests must have been blown away. Hi, Linda! I felt absolutely honored to be able to do it again. I hope I’m able to do it for decades to come! Have a wonderful weekend, my friend! This table is just beautiful! The centerpiece is fabulous. I love the pink pumpkins they are so elegant! A beautifull table for such a worthy cause! You are amazing, my friend! Your guests must have loved your wonderful luncheon. Thank you, Elaine! Thank you so much. Again honey you did a wondeful job not to mention the your support to breast cancer. The centre piece and eveyrthing is so beautifully done. Absolutely BEAUTIFUL!!! I love the exposed chest. We can never, ever stop bringing awareness to this topic. You did an amazing creative display as usual. It is obvious that you put a great deal of time and care into the presentation. I am always so proud to call you a friend because your giving spirit is so evident in all that you do. Thanks for sharing your talents. I will call you soon. LINDA!!! Hi!!!!! So glad to see you here! I’m so glad you like the tablescape. It made me feel good to create it. Love to you and your other half. We’re outta here again this weekend to Pittsburg, KS. Ugh! 😦 But as long as I can be with Ramon, it’s all good. Oh….FANTASTIC….TRULY FANTASTIC!!!!!!! Love the pink/the dress form/the flowers and THE CAUSE!!!! I can tell that you totally put your heart into this and I think it’s fabulous!!!!!! Hi, Lana! Thank you!!! “The Cause” is what it’s all really all about! Thank you, and welcome back!!! I hope you have had time to catch your breath. I’m still making my way through all the blog posts, but I look forward to reading up on how you’re doing now that you’re back on terra firma! Great job Alycia. This is a beautiful table. I am sure everyone at the luncheon felt so honored that you put that much attention into every detail. I love the bling pumpkins but after hearing about your poor fingers I won’t give that a try. On a side note, I am so happy that the world is getting to see all of your God given talent. You are such a hidden treasure. What a great way to honor the survivors and pay tribute to the ones that didn’t. The symbolism is quite amazing, and just stunningly beautiful! Love the blinged out mini pumpkins, and your gorgeous centerpiece. My cousin just walked 60 miles in DC for the cause and to remember her sister who died last year about this time from breast cancer. I believe they raised quite a large sum! I will send her your link, so that she can see your gorgeous table. I believe breast cancer has touched all of our lives in some way, and your post serves as a fitting reminder. I love all the elements here, you are amazing, both talent-wise and giving-wise (wait is that a word???) Anyway, thanks for sharing this!! Beautiful!!! Thank you so much! Hats off to your cousin and all the others who took part in the all-important walk! Breast cancer is such a pervasive and ugly disease, and there has GOT to be a cure sometime soon. Enough sisters, mothers, wives, cousins, and friends have been lost to a disease that makes no sense whatsoever. Alycia, your creativity leaves me in awe…this table is one of my favorites of any you have done. Awesome! This is really beautiful! Such a worthy cause as well. Alycia, You should consider sending this to Susan B. Komen. I know they could use your creativeness. Your table is stunning and moving for a hope we all need. It has moved me to tears. Good morning, Bonnie, and thank you so much! That is so sweet! Breast cancer is a disease that takes the lives of so many women (and men! ), and we have to keep the fight going and the cause in the forefront of everyone’s mind. I can’t stand the idea of losing a friend or family member to this vicious killer. Thank you so much for stopping in this morning, Bonnie, and I wish you a peaceful weekend! Holy Luncheon, Batgirl! This is a KNOCKOUT! Thank you so much for your kind words. Your tablescape is beautiful. I found the football s and p shakers at Kroger, believe it or nit. Tuesday Morning also had football items. My hubby went to Miss State so I have to give them equal time next month!!! Your pumpkins are beautiful as is everything on your table. Great! Thanks so much for getting back to me so quickly, Cynthia! I really appreciate it! I’ll check out Tuesday Morning since we don’t have Kroger here in the Midwest anymore. (They left the Kansas City area way back in the 60s or early 70s, I think. :-() Bill over at Affordable Accoutrements is always talking about the great bargains he gets at Kroger on flowers. Sounds like you live in “a house divided” with the Ole Miss and Miss State rivalry. 🙂 It will be interesting to see “his” table! Thanks again and have a great evening! Oh my. This is so stunniing!! I can’t remember ever seeing a table any more beautiful than this one. I loved the centerpiece, both the gorgeous flowers and the take on the theme. 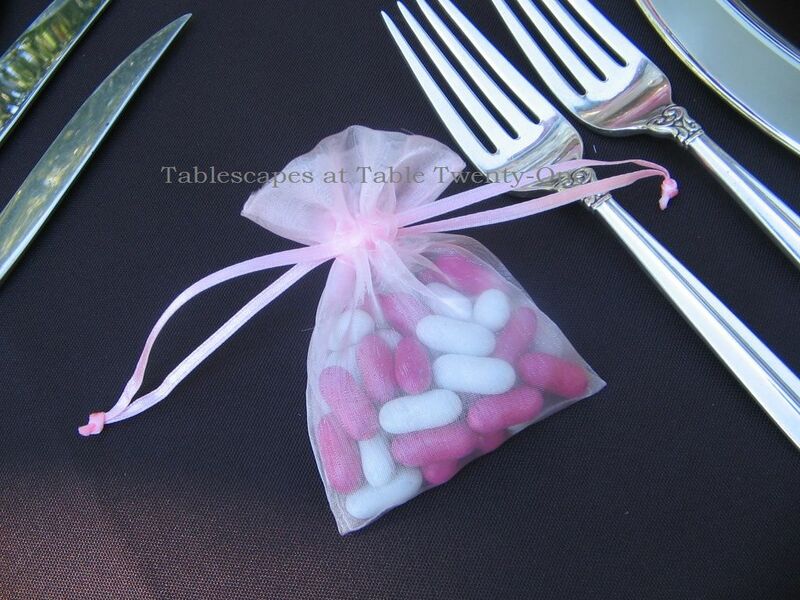 Loved the way the napkins were folded like pink ribbons. SInce I’m currently praying two different people through this trial, I love it all the more. OH, Debbie, I’m sorry to hear about your friends’ battle with this awful, awful disease. My prayer is that they are relieved of any pain & suffering and that the cancer will leave soon them. I’m so glad you like the table setting, and I wish you a safe and happy weekend! Take care, and thanks so much for stopping by! Alycia, this is beyond incredible!! What a beautiful and inspiring table. Every detail is just perfect and so well-thought out as you always do. Thanks so much for stopping by!! It is always great to see you!! Hi, Anita! Thank you!!! Enjoy your day! I’m visiting your blog via Infuse with Liz. This is an OUTSTANDING tablescape. Your attention to detail is amazing. How wonderful that this luncheon takes place each year to celebrate a friend’s victory over breast cancer. I’m so glad I stopped by – what an inspiration! Hi, Wendi, and thank you so much for stopping by! I really appreciate it!!! Your visit means a lot! Enjoy the remainder of your weekend! Truly amazing, Alycia. This beautifully expresses your unique creative energy and your infallible eye for color and design. I’m glad you were able to do this for your friends and appreciative that you could share it with all of us. The love comes through, along with your oh-so-important message. Inspired and inspiring, my friend! Thank you, Bill! Your opinion is always so important to me, and I greatly value it. This is one of the most important events I look forward to each year because it celebrates the defeat of cancer in at least one. One life at a time………. 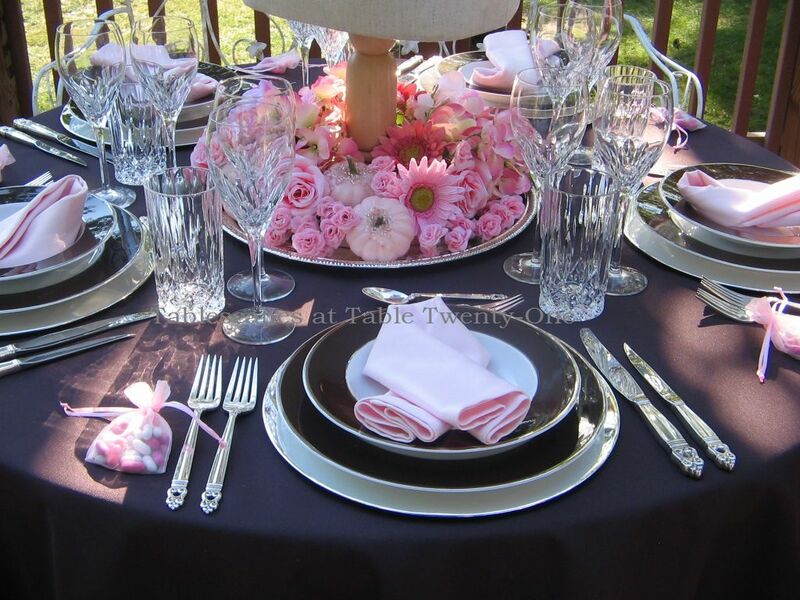 Stunning table setting Alycia…every detail amazed me. I was so taken by the little slip of pink sticking out from under the tablecloth. The good and plenty were a brilliant touch. The folding of the pink napkins also brilliant. 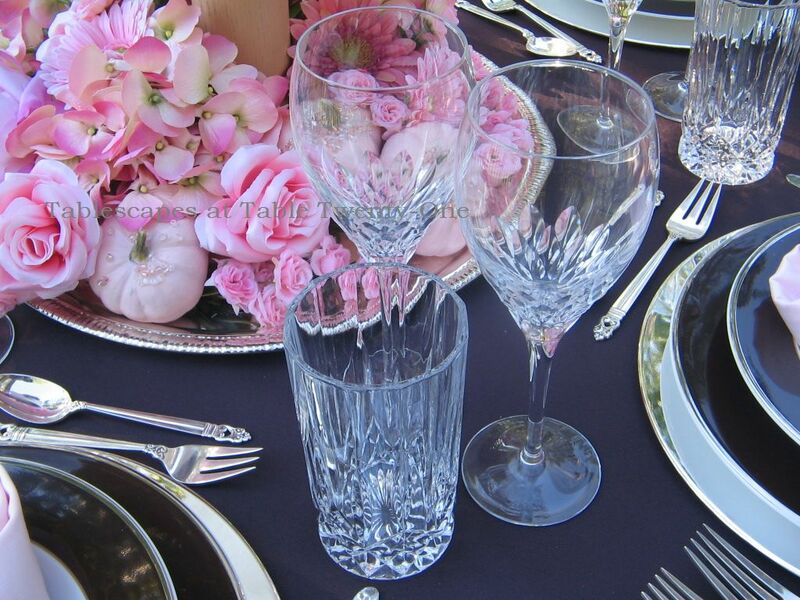 The floral centerpiece is breath taking and the dishware brought up so many notches. You are so creative and your kindness and thoughtfulness really shine through in this post! Hi there! Thank you so much for stopping in today! I’m glad you like the set-up…it was a joy to create. Enjoy the rest of your weekend! Good morning, Poppy, and thank you so much!!! This was a nice message to wake up to this morning! You have a great week, too, and thank you for stopping in! Thank you, Sonya! Thank you so much! I just hope for the day I don’t have to create another pink ribbon table because the disease has been completely eradicated from this earth!!! This is so pretty! I love the way you did the napkins. The flowers, everything is so perfect. Hi, Debbie! Thank you! The napkins were my husband’s idea in a roundabout way. He says things sometimes that get my brain working! 😉 Thanks for stopping by, and have a good weekend! Alycia, I am just SO impressed. Every single detail is perfection. 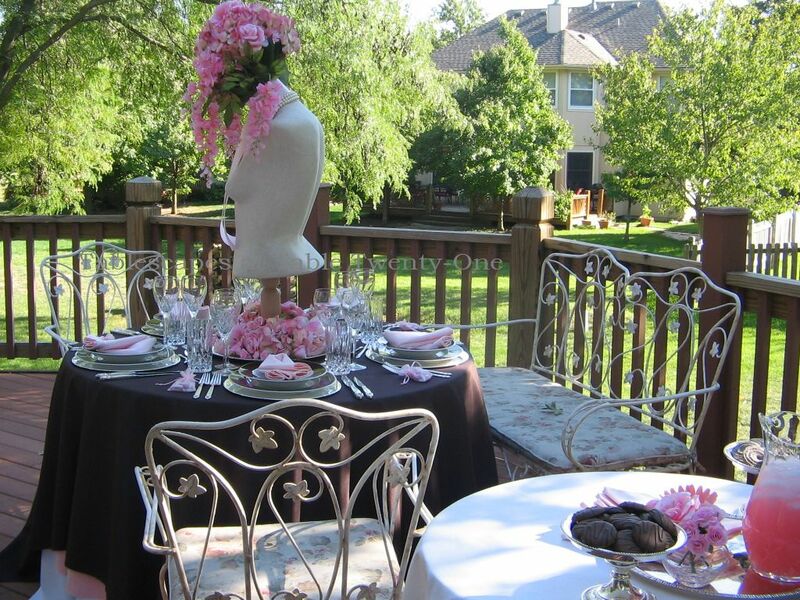 I love the manequin as the centerpiece and all of the pink. You just socked it out of the ballpark with this and for a great cause! Alycia I am so touched yet in such awe at this beautiful table and the meaning and celebration behind it. Both my sister and mother had breast cancer. My sister died from it. My mother had a radical masectamamy (sp?) and lived to 87. My daughter in law is presently in breast cancer remission. And my husband has bone cancer….his second time around. The first was a very rare form of lung cancer (he is a non smoker) and part of his lung and lymph nodes were taken. It came back into the bones last Sept. But he is doing well. I applaud you for doing this wonderful luncheon and your table is breathtaking. Once again, you are an inspiration to all!! Such a beautiful table! I hadn’t thought that deeply about the details I can do in my tablescapes. Love your blog! 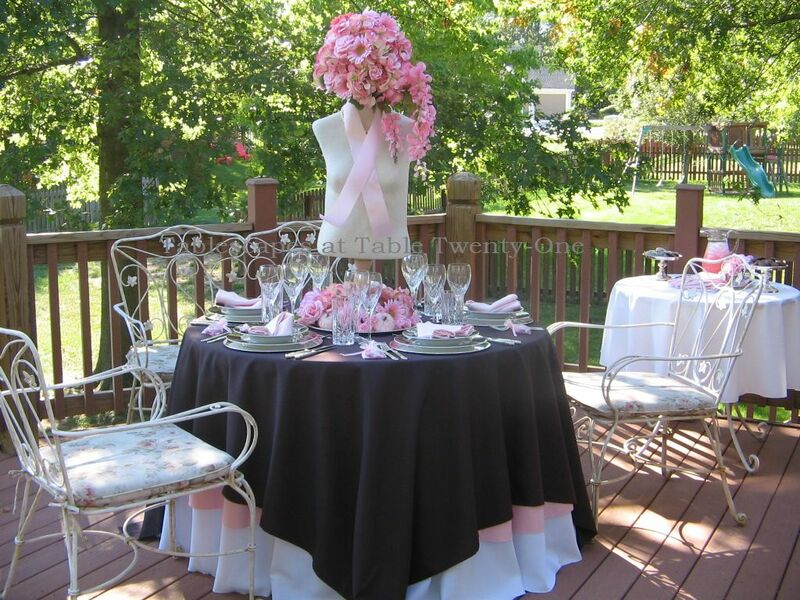 Alycia…this is one of my favorite tables….it is simply gorgeous…I love the way you folded the napkins into a pink ribbon…the table is elegant…so fitting of the ones you are honoring…I have many friends that have been affected by this horrible disease….this table just takes my breath away…such a wonderful tribute Alycia…Bravo!!! What a very wonderful post honoring those that have suffered. Your table is absolutely gorgeous. Keep up the good work. Every detail is absolutely gorgeous, Alycia. I absolutely LOVE the ribbon around the torso. Outstanding and thought-provoking. this is just beyond wonderfulness Alycia !!!!!!!!!!!!!!!!!!!!!! I havwe been meaning to give this exact thing a try – been a number of years since I have done it….lost my BFF to BC years ago…..now my sister is a recent survivor. You just inspired me to do this. Beautiful table settings! Happy Pink Saturday! I am in love with this event! Can you tell me how exactly the oasis was placed on top of the manikan?